Funny, I started writing this the day before the possible purchase made the news. I have been using Waze for 3 years. 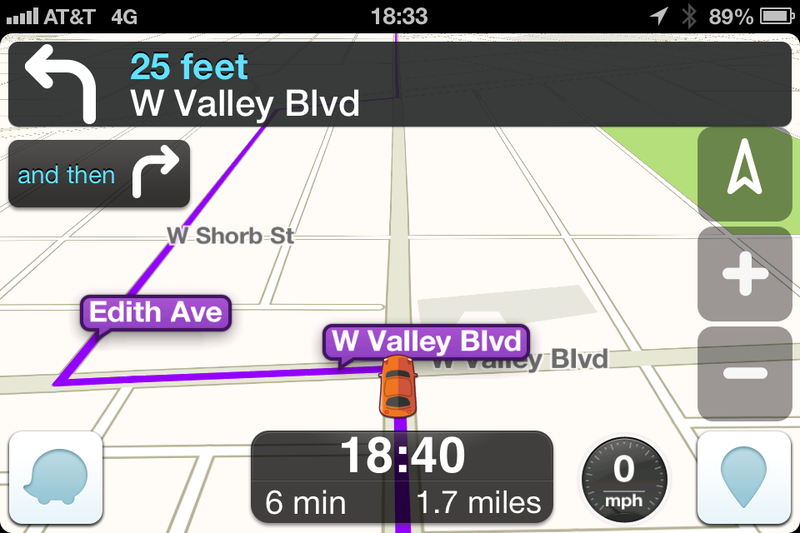 Whenever I am on the road, I run Google Navigation on my Droid 4 and Waze on my iPhone 4S. Google used to give incredibly accurate (to-the-minute) ETAs but something changed in the last few months, their ETAs have been increasingly wrong (optimistic). Google clearly has more speed data than Waze (unless you opt-out, every Android phone constantly uploads position and speed information) and yet, Google seems to have forgotten how to factor in delays caused by traffic jams enroute. 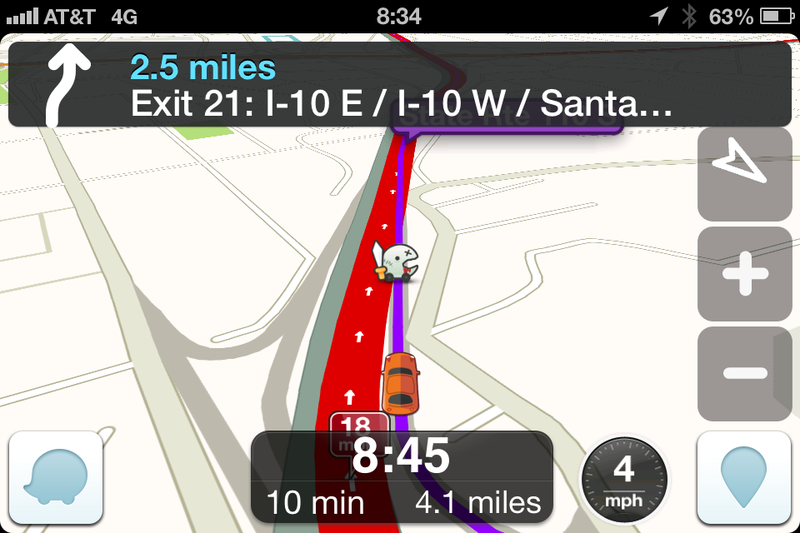 Waze never did this well either so now they’re about the same ETA-wise. Both are frighteningly good at predicting my next destination. Normally, both ask if I am going home from daycare. But Google has learned that Wednesday is usually pizza night and asks if I am going to Costco instead. Google presents a sorted list so I can easily select the top entry. Waze asks if I am going to X and automatically routes to X if I do not press anything for 10 seconds. 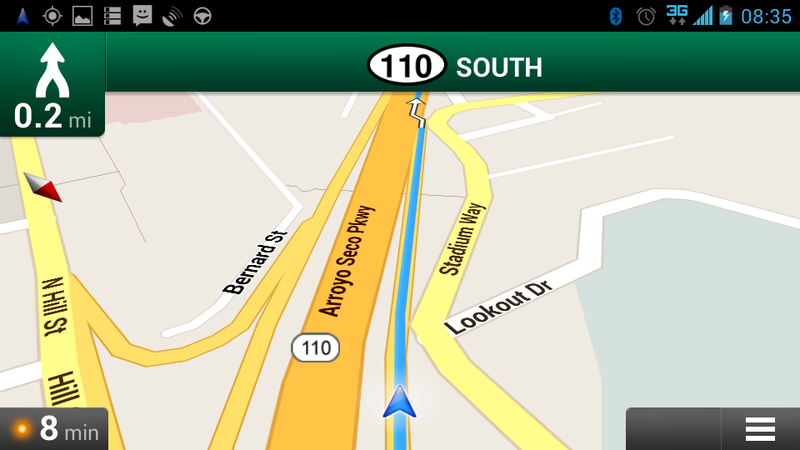 One button toggle between display of entire route and local (navigation) view. One button display of alternate routes with distance and drive time for each. 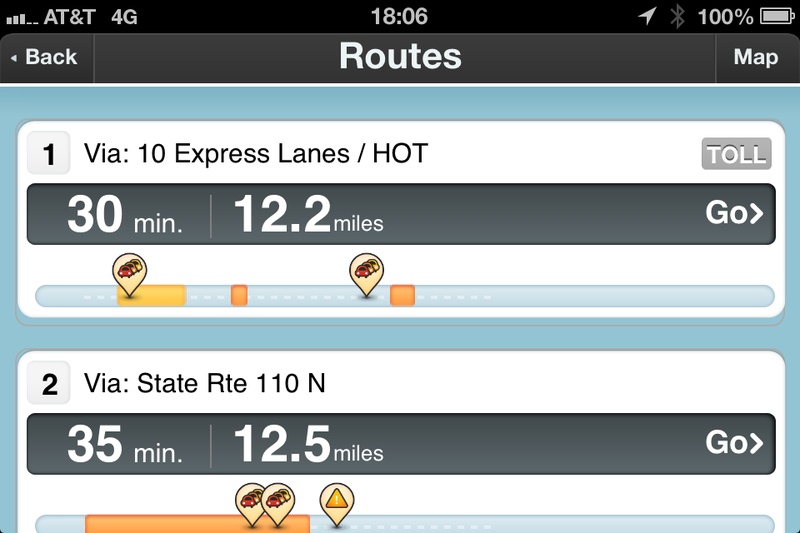 Usually more accurate display of traffic speed (compared to Waze). 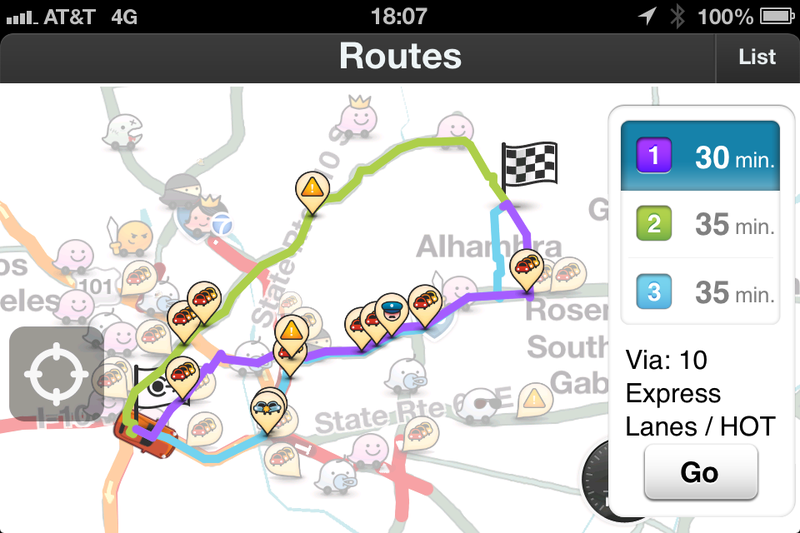 Usually better route calculation (compared to Waze). No user-reporting of incidents. 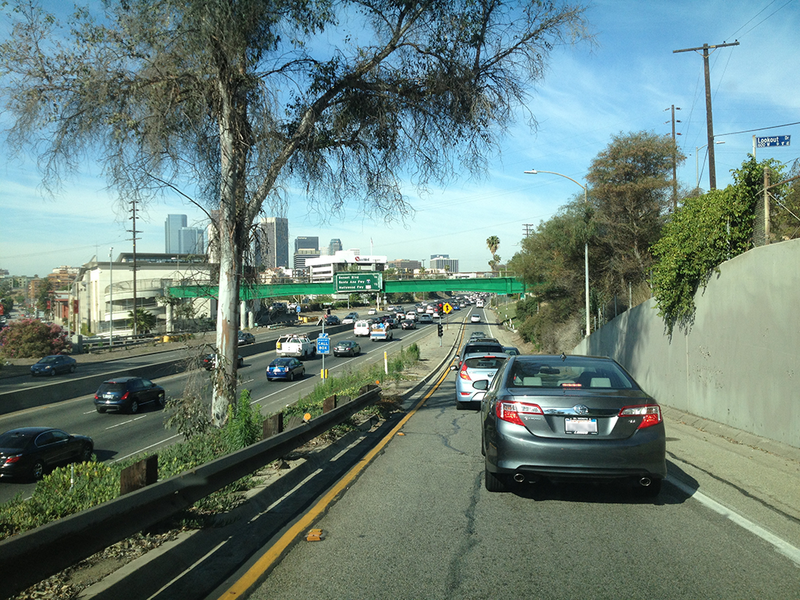 Far too often, Google will think the freeway is clear when it is actually a parking lot due to a stalled vehicle. But there is no way for me to warn other people. Refuses to consider surface streets as an alternate route. Refuses to use carpool/express/HOV/HOT lanes. In fact, Google does not seem to know how to handle them at all because while I am in the carpool lane, Google constantly suggests ludicrous routes to exit it. Cleaner local (navigation) view with useful info: speedometer, ETA, miles to go, remaining drive time. Rapidly reported, accurate, crowd-sourced incident and traffic information (compared to Google’s reliance on Caltrans / CHP). 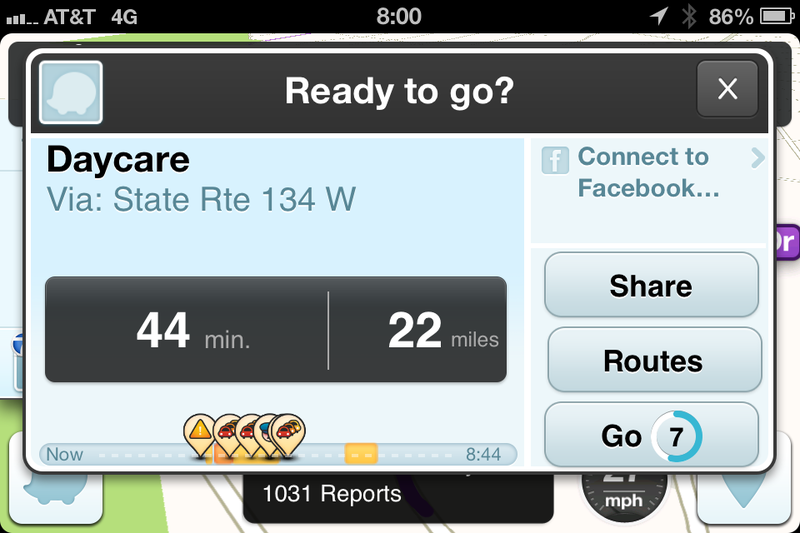 Crowd-sourcing is obviously better if there are many active Waze users in your area. Also, I often send alerts with photos. Occasionally faulty route calculation. 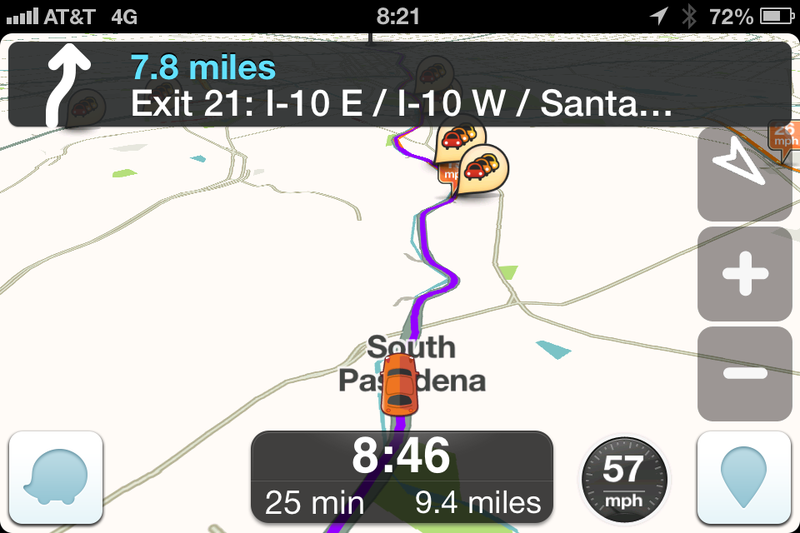 Sometimes Waze knows an alternate route is slower (ETA is later) but still displays that route. Sometimes the detour is obviously slower to an experienced driver because it involves multiple left turns at uncontrolled intersections. 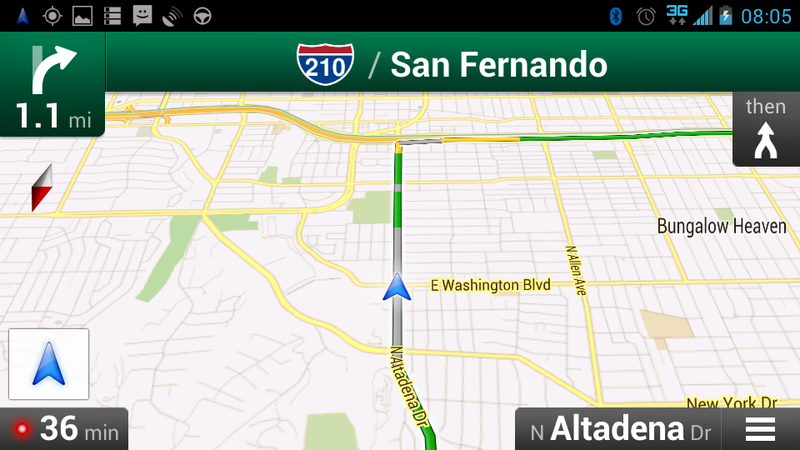 Needs single-button entire route display like Google. 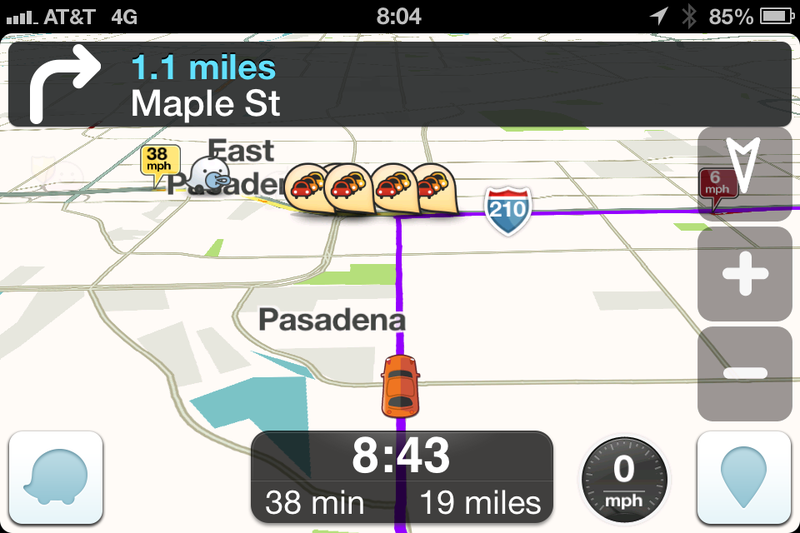 Both Google and Waze occasionally suggest a “better” route that is actually worse. 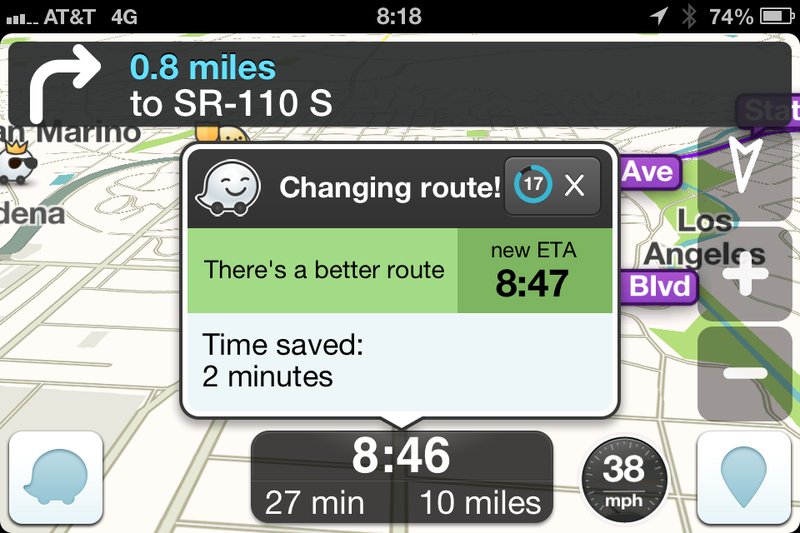 Here Waze suggests a “better” route that has an ETA of 08:47 while the ETA for the current route is 08:46. 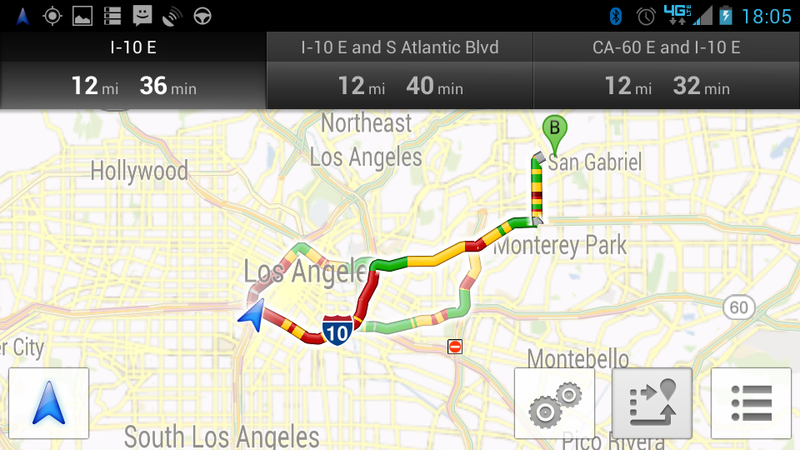 Google’s entire route view presents much more useful information than Waze. 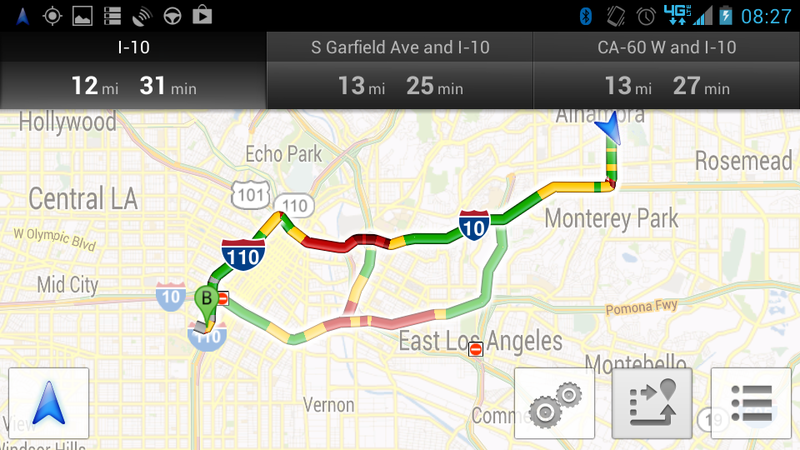 Here, Google thinks traffic is slow ahead while Waze shows no data. I have to click on the Wazer alerts to see their content. They may warn that the freeway is slow but I should not have to click on them while driving at 57mph to find out. 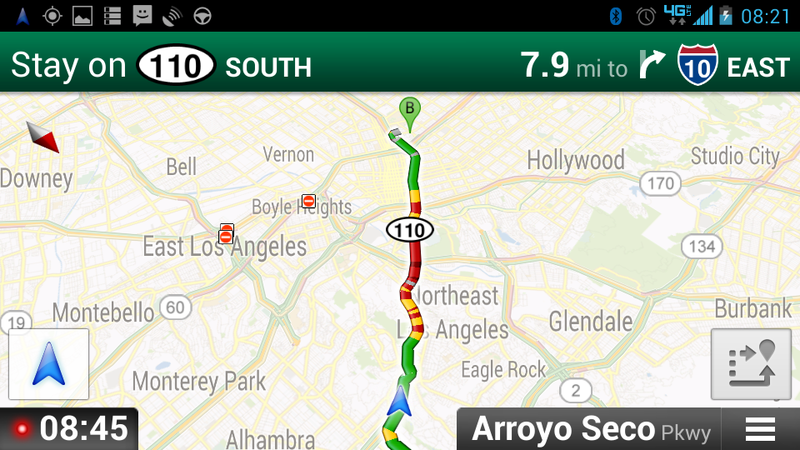 And another example of Google vs. Waze alternate route calculation. 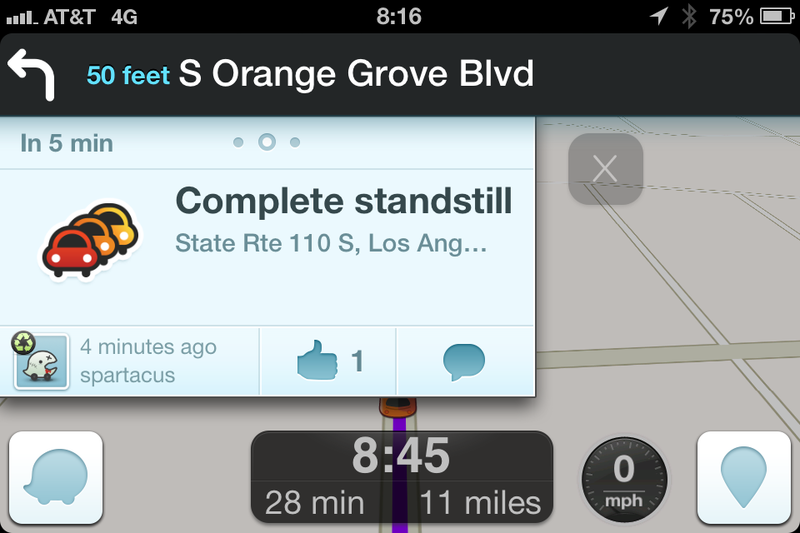 Waze correctly suggests the carpool lane which is the faster route. 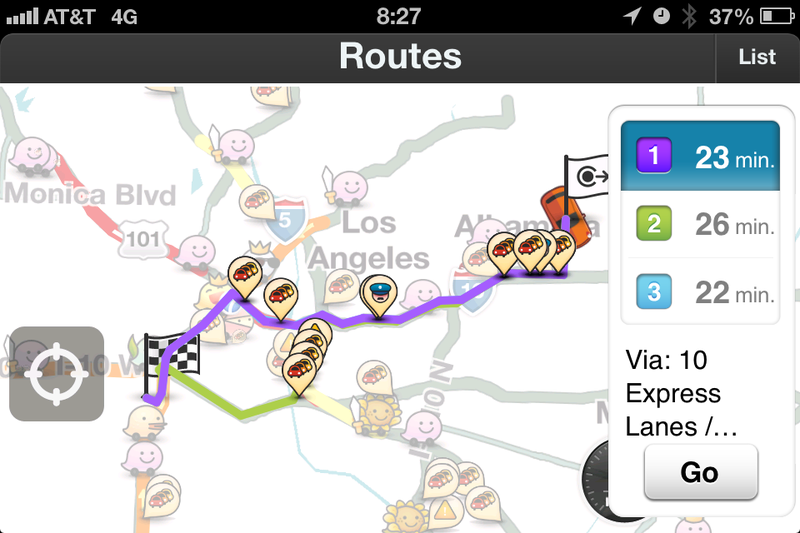 And an example of Waze’s incorrect “detour” routing. It wants me to make a left turn (controlled) at a very busy intersection, right turn onto a side street with stop signs, then left turn (again controlled) back onto the same street. Local drivers are smarter than the algorithm, we know this would be far slower. I am hoping that Google assimilates some of Waze’s better features: user reporting, surface street routing and carpool lane awareness. This entry was posted in Navigation and tagged comparison, Google, Waze on 2013/06/13 by robert.